This case study is a continuation from Research case study: My lost connection to Thomas “The Immigrant” Christian of Charles City County, Virginia (https://genealogyadventures.net/2019/02/04/research-case-study-my-lost-connection-to-thomas-the-immigrant-christian-of-charles-city-county-virginia). The Genealogy Adventures geneticists are currently grappling with the DNA segmentation and sequencing work necessary to confirm the identity of the white Christian family male who is my 4x great grandfather. Whoever he turns out to be, DNA is ultimately pointing towards Thomas “The Immigrant” Christian (born about 1630, United Kingdom, and died in Virginia) as his direct ancestor. While they are busy beavering away at their monumental task, I’m picking up the gauntlet to determine the identity of Thomas Christian’s parents. This is an equally monumental task. Thomas Christian has presented his American descendants with a centuries old brick wall. I am not daunted at the prospect. I have been here before quite a few times. My article Ann St. Clair of Wytheville, VA: Finding my lost connection to the St. Clair / Sinclair family (https://genealogyadventures.net/2016/11/26/ann-st-clair-of-wytheville-va-finding-my-lost-connection-to-the-st-clair-sinclair-family) is the perfect illustration of my successful research work in this area. I covered how we identified the white father of my 3x great grandmother, Ann St. Clair of Wythe County, Virginia…and the process we went through to identify his father. It’s a good thing I’m never daunted by genealogical cold cases. When it comes to Thomas Christian, his isn’t simply a cold case – it’s frozen. No one has any true idea of who his parents were. This is a topic I will return to at the end of this case study. My first stop in researching had to be British lineage books. When it comes to researching pedigrees back in the Old Country, I won’t use American lineage of family history books. I have simply been burnt too many times due to errors. If I’m researching my ancestors back in their respective homelands, I will only use resources from their country of birth. Wherever possible, I will only use primary sources – unless a secondary source corrects an error in the primary source (and only if the secondary source contains sources and citations I can refer to). Numerous American lineage books cite the Isle of Man as Thomas’s birthplace. Frustratingly, none cite sources for this. Naturally, this information has been incorporated into a staggering number of online family trees. Said trees also cite two different Manx men as Thomas’s father. I took all of it with a grain of sand as the trees didn’t have any sources or citations. What I did do, however, was scribble some notes, including the names of the two Manx Christian men, as items to research. 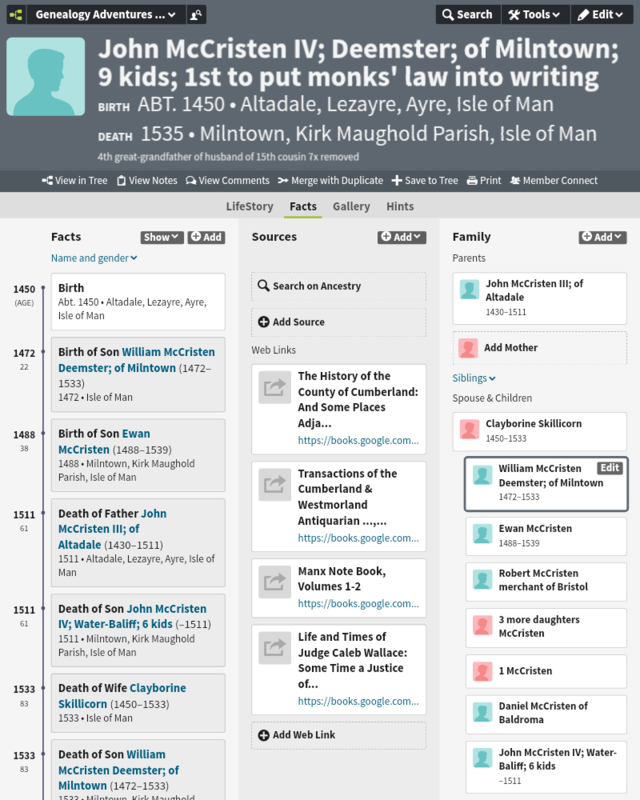 While I eventually discounted both men as Thomas’s father (see the last two sections), I was inclined to believe one thing: a strong case began to emerge that Thomas indeed had a connection to the Isle of Man. It’s the ‘how’ that is going to make this such a fascinating journey for 2019. As is my preference, I began searching for British pedigrees and lineage books.After a couple of hours searching on Google Books, I found what I was looking for, which you will see below. 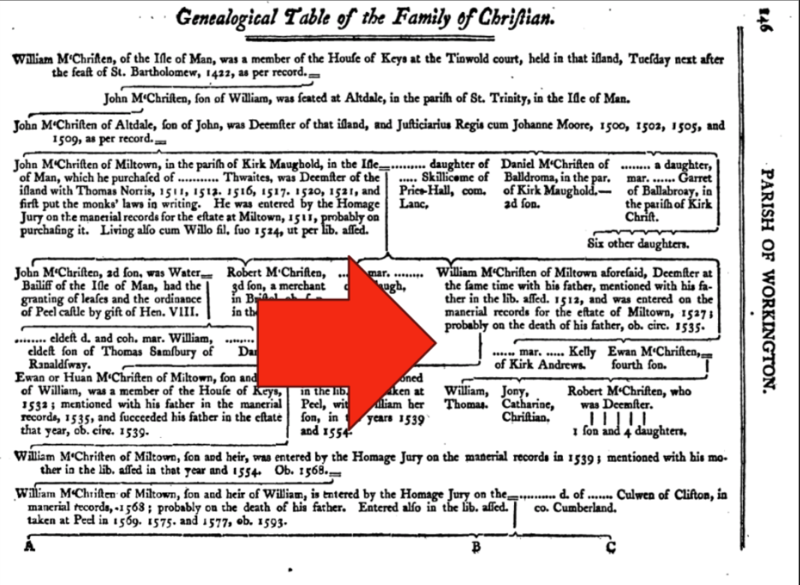 I began to build a Manx Christian family tree based on the pedigree chart below. If I’m going to disprove or prove Thomas’s ancestry, this was something that had to be done. Note: to see larger images, click on the individual images. Pedigree chart taken from: The History of the County of Cumberland: And Some Places Adjacent, from the Earliest Accounts to the Present Time: Comprehending the Local History of the County; Its Antiquities, the Origin, Genealogy, and Present State of the Principal Families, with Biographical Notes; Its Mines, Minerals, and Plants, with Other Curiosities, Either of Nature Or of Art, Vol. II, by William Hutchinson, 1794 – Cumberland (England) via https://books.google.com/books?id=2X8gAQAAMAAJ&dq=christian%20of%20altdale&pg=PA146#v=onepage&q=christian%20of%20altdale&f=false Note the myriad of spelling variations for the Christian surname as you work your way through the pedigree chart. The first thing to note is that Thomas doesn’t appear anywhere. No…I wasn’t going to get lucky like that. I didn’t expect to. Then again, there are plenty of gaps in this pedigree which focuses on detailing two specific Christian descendants: 1) those who inherited the family’s estates; and 2) those who married well and/or had notable descendants. In other words, not every child born to a couple had detailed descendants lines. When choosing an anchor Christian to build a tree from, it made sense to begin with the gentleman below, John McChrystyn. My reason for starting with him was simple. He is the oldest known and confirmed progenitor of the Manx Christians. The first three confirmed generations of this family only reference one child in each generation. I highly doubt that three generations of this family had only one child. 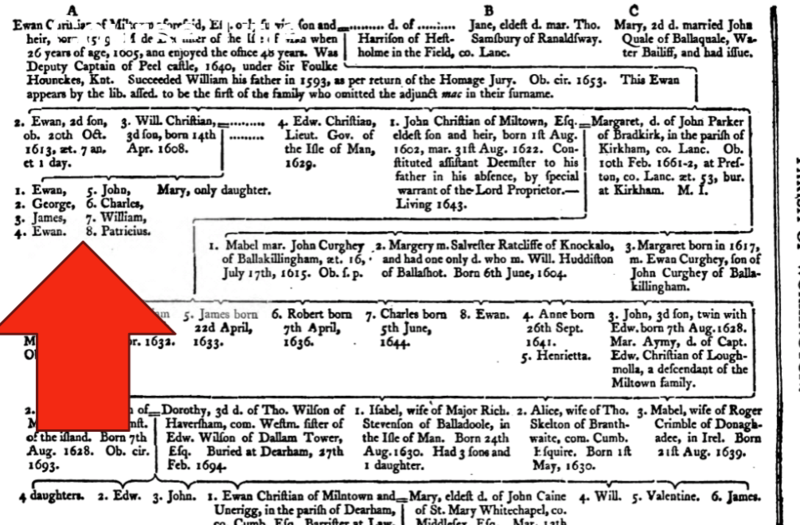 The subsequent and better documented lines show anywhere from six to twelve children per married Christian family member – generation after generation. The next two images illustrate some of the challenges of working with the Christian family pedigree. In this image, we are looking at Ewan McChrysten, son of William. While he had 5 children, none of them are cited by name. Further online research hasn’t revealed any of his childrens’ names. Things like this are big research hurdles to overcome. In this image, we are looking at the children of William Christian. In this instance, we know their names, but nothing further. While I have been able to find half of them via paper trails, the other half remain untraced. In the course of researching as many individuals cited in the pedigree chart as possible, new facts came to light. The Isle of Man was ground zero for the Christian Family from the 1300s onwards. However, from the early 1500s, the family branched out to Cumberland in England. In the early 1600s, they branched out further into London and Middlesex County, Lancashire (Liverpool), and Ireland. This means there are six places to search for Thomas’s parents. While I have a hunch that Cumberland and the Isle of Man are the strongest candidates for his origin story – I can’t discount London, Middlesex County, Lancashire or Ireland. Due diligence demands research in all six places. What I was hoping (okay, praying) was going to be a relatively straightforward research project suddenly became more complex with so many widespread places to research. As I’ve mentioned, one thing became abundantly clear when I spent a few hours pouring over the above pedigree: only a fraction of this family was thoroughly documented in this pedigree chart. In other words, a picture began to emerge that it was likely that Thomas descended from a Manx Christian who wasn’t named in this pedigree. Or, he descended from one of the many males who didn’t have a lineage included in the pedigree. Where was the most likely place for Thomas’s ancestor to be? I began with his name: Thomas. This was a family who named their children for family members. So which Manx Christian line featured the name Thomas? In the above pedigree, the answer is simple…none of them. Thusfar, I have found six Thomas Christians born on the Isle of Man between 1400 and 1640. So far, Thomas wasn’t a common name in this family. His name wasn’t going to be a very useful clue, not where the family pedigree chart was concerned. However, looking at the names of Thomas’s sons, they had names that repeated throughout the Manx Christian family: John and Charles. And, to a lesser extent, James. Edmund was a repeated name among Thomas’s Virginia descendants – and so it was among the Manx Christian family. There is one Manx Christian male name that was conspicuously absent for Thomas’s Virginia descendants: Ewan. 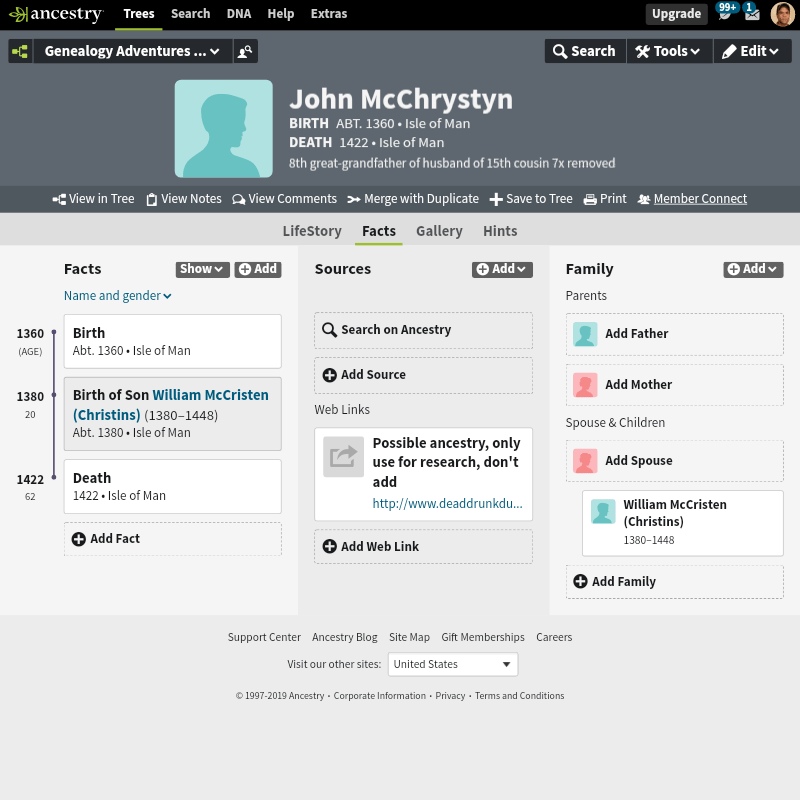 Most of John McChrysten III’s (John III < John II < John I < William) descendants named at least one son Ewan; even his female descendants. Yet, there wasn’t a single Ewan among the Virginian Christians. This is another reason why I don’t believe Thomas descends from John McChrysten III, which the vast majority of trees claim. Clearly, there was a celebrated Ewan McChysten/McChristian/McCristen – a man of note. It’s surprising that the name didn’t travel with Thomas. It’s something this can’t be ignored or overlooked. 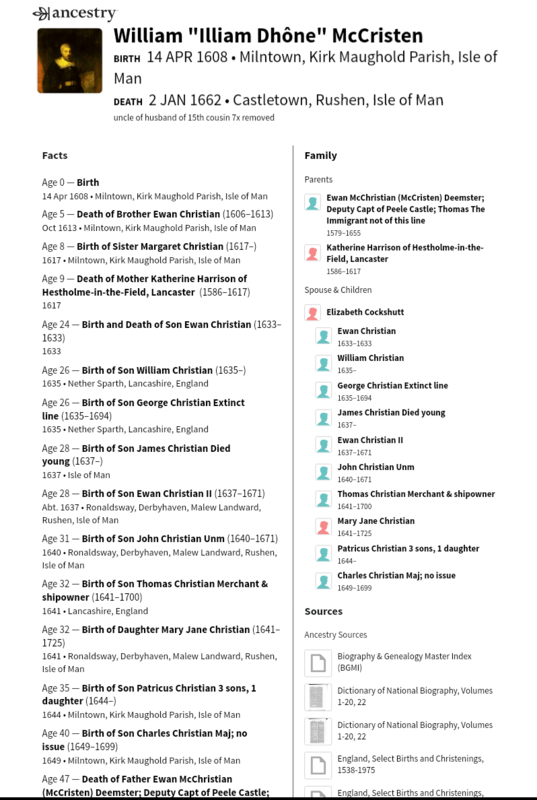 Still, I was left none the wiser as to where Thomas fit into the Manx Christian family tree.In this instance, using naming conventions as a genealogical clue was a big ole bust. So, to get some ideas about potential couples to research, I peeked at some family trees once more. Let’s look at the two men claimed by Thomas’s American descendants as being his father. 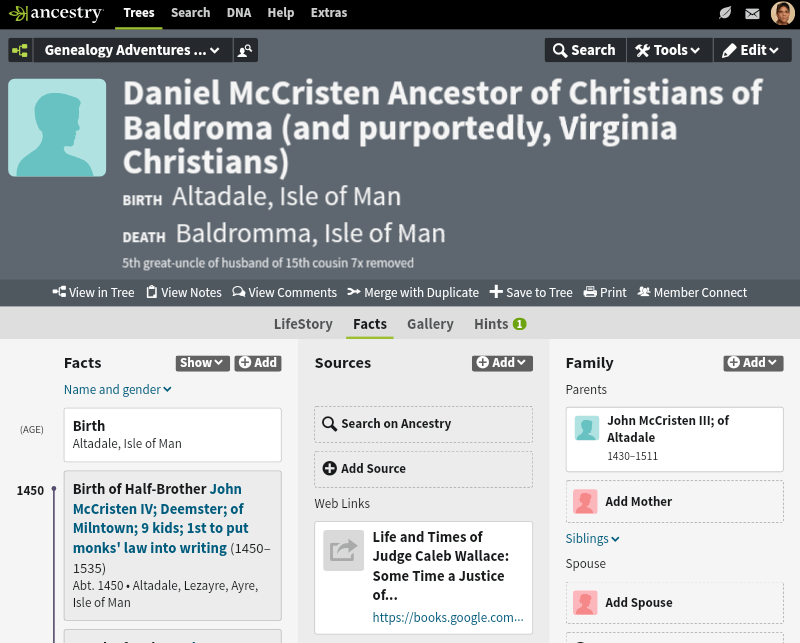 Approximately 90% of the online family my trees claim William McCristen is the father of Thomas. He had a son named Thomas, who was born in 1641 (Manx baptism record). Careful research would have eliminated him as a paternal candidate. I was initially suspicious due to the discrepancies in the years of birth of my ancestor Thomas, and this William’s son Thomas. Okay, no one seems to know when Thomas Christian was born. Considering the birth of his oldest known child, and his marriage, it’s believed Thomas was born closer to 1630 than 1640. There’s just no getting around that. Secondly, William’s son Thomas is fairly well documented. For instance, he never stepped foot in the American colonies. It’s doubtful he ever left Britain at all. He was a very successful merchant and shipbuilder in Liverpool. He grew rich from trade, as well as building, owning and operating ships…and the Trans-Atlantic Slave Trade. Here is a snippet about William’s son Thomas. The Thomas Christian born in 1641, son of William Christian, cannot be the same man as Thomas “The Immigrant” Christian. Next up is Daniel McCristen. Daniel has the distinction in around 10% of the family trees I have seen as not only being Thomas’s father – but the father of 5 Christian men who arrived in Virginia in the 1600s. Again, these trees have zero sources of citations to support this claim. I don’t see how anyone could reach that conclusion. Nothing is known about Daniel’s life. No marriage record for him has been found online. Indeed, the only time I have seen his name has been strictly limited to this: simply as the son of John McCristen III. What I do know is this: Daniel had to have been born before his father died in 1511 (probate year, and given in his internment records). There is no way he could have fathered a child around 1630. It really is as simple as that. Daniel was another dead end. With so many gaps and holes in this family’s history, there really is one thing to do. I’ll be spending a week researching them on the Isle of Man this year. I will digitize every applicable record, and build a more complete family tree for the Manx Christians. Truly, it’s the only credible way to crack this stubborn brick wall. If I strike out on the Isle of Man, next up will be a trip to Cumberland. And, if that doesn’t yield an answer about Thomas’s parents, it’s a trip to the National Archives in London.